Math fact fluency is so important as kids begin to do more advanced math. We love to have fun practicing math facts with activities like Nerf Gun Math and Subtraction Squish. If you’re looking for other ways to make math practice fun, check out these math games. While I like coming up with hands-on ways to practice math skills at home, sometimes it’s nice to have an activity your child can do without all the prep work. 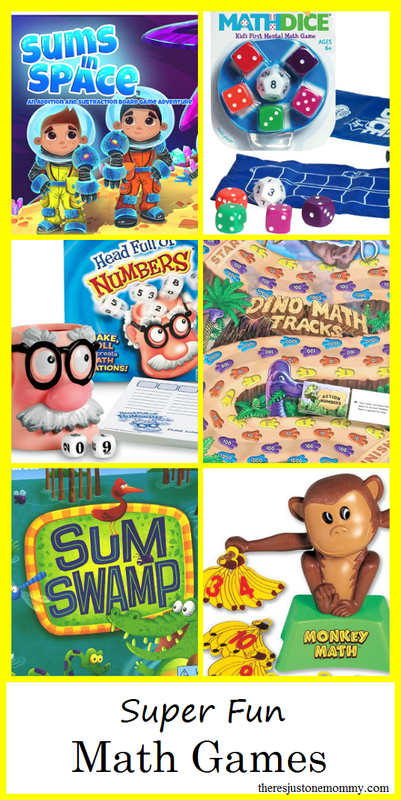 These fun math board games mean your child can have fun practicing math anytime and anywhere. Monkey Math — (ages 4-7) This fun math game is perfect for kids who are just learning addition. I love that it combines addition with the idea of a simple scale. Your child will have fun hanging the numbered bananas from the monkey’s hands. If the numbers on each side add up to the same number, the monkey will look straight at you with his arms level. If not, his eyes will cross and his arms will hang down. Sums in Space — (ages 5+) Kids will have fun working on adding and subtracting numbers 0-9, comparing greater/less than, and identifying even and odd numbers, all with a space twist. With 3 difficulty levels, this game will grow with your child. Ocean Raiders — (ages 4-8) Watch out for storms and brave whirlpools as you try to get to the treasure at the bottom of the ocean. Your kids will have a blast working on 1 and 2 digit addition facts in this adventure game. Sum Swamp — (ages 5+) Have fun moving your swamp creature through the swamp in this award-winning game. Roll the dice and then add or subtract to determine how many spaces your character will go. Who will get to the finish line first? Head Full of Numbers — (ages 7+) Place the dice in the silly shaker and roll. Then set the timer and see how many equations you can make with the numbers you’ve rolled. Your child will have fun working on addition, subtraction, multiplication, or division skills alone or with the whole family in this fast-paced game that is perfect for working on fact fluency. Dino Math Tracks — (ages 6+) Practice math skills with a dinosaur twist! Roll the 4 dice and then put your dinosaur pieces in the right place value spots (ones, tens, hundreds, thousands). Kids will also strengthen addition and subtraction skills as they work to get to the finish line. Math Dice Jr. — (ages 5+) This is the perfect math game for on the go. Roll the 12 sided die to reveal a number, then roll the other 5 dice to give you a set of numbers with which you have to make the first number. You can use multiplication, addition, division and subtraction to achieve this goal. This game is best suited for kids who have mastered their math facts. Money Bags — (ages 5+) Learn how to collect, count, and exchange money in this fun math game. In order to collect money, kids must use the spinner. If it says “no nickels,” they have to count out their money without using nickels. If they land on “Bank Exchange” they can exchange their money (2 dimes and a nickel for a quarter). Whoever has the most money at the end of the game wins. Math War Multiplication Cards — (ages 8+) For just a couple dollars your child will have fun practicing multiplication facts with this simple card game. Players solve the math problem on their card and lay them down, just as in the usual War card game, the card with the highest value wins. Zoom — (ages 9+) This is another fun multiplication card game. Just when you think one player is winning, you pull a wild card and the score suddenly zooms forward, or backward, or no where at all. These math games make math fact practice at home more fun. They’d also be great for a math center at school.